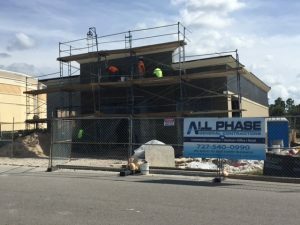 We recently sat down with Justin Lee, owner of All Phase General Contractors to discuss his experience with ActionCOACH Tampa Bay. Justin was recommended to coaching about a year ago by a mutual colleague that knew Juliet Kyes. The mere thought of coaching was out of Justin’s comfort zone, but he decided to take the initial meeting because he knew how hectic it was becoming to run his growing business and it needed to be addressed. While the business was growing and the team expanding, being a father with active children and a business owner was a definite juggling act and the work/life balance was becoming a challenge. Coaching has brought many benefits to Justin and his team. “Delegation has never been a strong suit of mine and this was one of the first areas that Juliet and I started to focus on in coaching so I could stop chasing my tail.” Mr. Lee stated. Developing processes that allowed more autonomy to his office manager to insure he could take a lot of the day-to-day administrative tasks off his plate to focus more on the business, was an immediate win. As part of coaching, Justin also created a new Business Development position that enabled the client management and bidding process to have someone directly responsible for it. All Phase has added other field positions and his coaching became a resource to help develop a new recruiting process, designed to expedite finding the right candidates. “From a work/life balance standpoint, the up’s and down’s still exist, but my mindset and the way I handle it has changed, Juliet has introduced me to not only audio books but also meditation techniques that help me disconnect” says Justin. These things admittedly were not things in Mr. Lee’s comfort zone but things he’s certainly seen pay off for him in the long run. Justin has been able to take multiple vacations with his family and is now the proud owner of his dream boat! This focus on balance and dedication has cleared time for Justin to make other improvements such as utilization of new Builder Trend software and upgrading the tablet technology used by his team. Additionally, All Phase is the proud owner of their own building now which has recently been remodeled! Justin’s experience in coaching helps him find accountability, continually focused on having continual goals and baselines to compare to the previous session. “I find coaching extremely motivating and jokingly I refer to Juliet as my therapist as it gives me an outlet to share upper level challenges that I typically can’t share with the rest of the team” says Justin. Coaching with Juliet provides another set of eye’s and ears on the business to provide an outside perspective. Having a business coach with a wide range of experience in multiple industries is beneficial to clients like Justin who are looking for inspiration and ideas to stay ahead of the curve. What Would You Say to Anyone Looking at Coaching? “Investing in coaching is a vital part of my business, having someone on the outside to help focus on things like; sales forecasting, profitability and factors happening in the marketplace is invaluable.” states Mr. Lee.